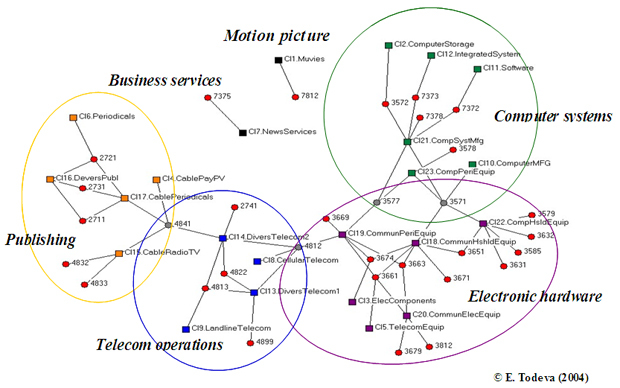 This collaborative project with David Knoke (University of Minneapolis) utilises a database of the largest 150 global firms that contribute to the Global Information Sector (including telecommunications, publishing, computer software and hardware, information services and data processing, radio and television broadcasting, and motion pictures). We have extracted records for their participation in specific product markets - recorded as US SIC codes for 1998 and 2002. We interpret each SIC code as a bundle of capabilities embodied in measurable outputs. The combination of diversification and convergence in the media, telecommunications and the information and the ICT sectors has created a number of industry segments with specific portfolio of complementary activities. The competitive forces in each segment determine different range of opportunities for growth.